Mu Lambda Kappa (MΛK) mentoring program was started at Dr. King Charter School in 2009. Eight concerned male staff members started the organization in an effort to provide guidance to the high school students and to encourage them to pursue college degrees. 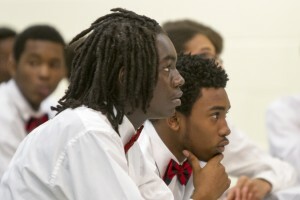 The goal is to train the high school students to become respectable young men. Assistance with academic and social skills is provided by the mentors. All male staff members are eligible to provide mentorship to the students. Since inception, MΛK has grown to 48 mentors and 46 mentees (30 current students and 16 alumni). The students have become leaders in and out of school. They are often selected to conduct school tours for visitors, speak during school programs and speak to elementary classes at Dr. King and Craig charter schools. The mentees also learn the importance of community service and participate in various community service events across the city. Yearly, the mentors and mentees go the hospital to distribute toys to patients. In 2014, at the request of a deployed soldier, they collected beads and funds to purchase king cakes to send to an army unit stationed in Kuwait. The mentees are often on the programs of the Lower Ninth ward community, where the school is located, and the group is often contacted by local politicians to attend various events. MΛK mentees have worked on professional attire since the program’s inception. In 2013, they began raising funds to purchase blazers for the young men to wear on designated school days and when at community events. 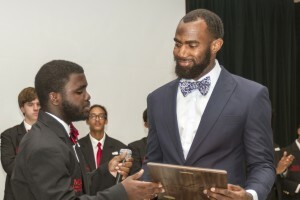 The Malcolm Jenkins Foundation (TMJF) willingly accepted the call and generously donated all of the funds to purchase the blazers for the programs first annual Blazer Ceremony. The Foundation’s Chair, Malcolm Jenkins has expressed a keen interest in the MΛK students and their success. His personal commitment, along with the support of TMJF’s Board of Directors has had a huge impact on the MΛK students. This, the first annual Blazer Ceremony, is an opportunity to recognize the young men who have worked so hard in the program and the generosity of Mr. Jenkins in supporting them.